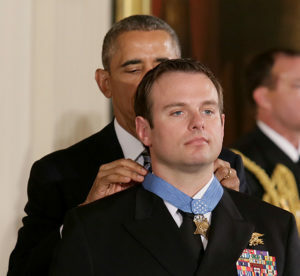 President Barack Obama presents the Medal of Honor to Senior Chief Special Warfare Operator (SEAL) Edward C. Byers Jr. during a ceremony Monday, Feb. 29, 2016 at the White House. Byers received the Medal of Honor for his actions during a hostage rescue operation in December 2012. On Feb. 29, Senior Chief Special Warfare Operator (SEAL) Edward C. Byers Jr. became the sixth Navy SEAL in U.S. history to receive the Medal of Honor. President Barack Obama presented Byers with the medal during a White House ceremony for his heroic gallantry as an assault team member attached to a Joint Task Force in support of Operation Enduring Freedom Dec. 8, 2012. During the ceremony, Obama praised Byers’ dedication to duty. “Like so many of our special operators, Ed is defined by a deep sense of humility. He doesn’t seek the spotlight. In fact, he shuns it. He’s the consummate quiet professional,” said Obama. Obama called Byers “a special breed of warrior,” part of a select few who serve the American people in the shadows with honor and sacrifice. “Our special operations forces are a strategic national asset. They teach us that humans are more important than hardware,” said Obama. “Today is a reminder that our nation has to keep investing in this irreplaceable asset; deploying our special operators wisely, preserving force and family, making sure these incredible Americans stay strong in body, mind and spirit. The American people may not always see them. We may not always hear of their success. But they’re there-in the thick of the fight, in the dark of the night, achieving the mission. And we thank God they’re there,” added Obama. Byers spoke at a press conference following the ceremony. “The important thing I want to say here is that everything we do is as a team; if it wasn’t for that team I wouldn’t be standing here today. Specifically for me, my teammate, friend and brother Nick Checque,” he said, referring to fallen team member Petty Officer 1st Class Nicolas Checque. “The award is truly his. He was an American hero and he was the hero of that operation. Today has been a very memorable day in my life surrounded by friends and family and it is truly something I’ll never forget. We’re gonna celebrate Nick’s life and celebrate the lives of the brothers that have fallen protecting our freedoms so that we can sleep peacefully in our beds at night,” added Byers. 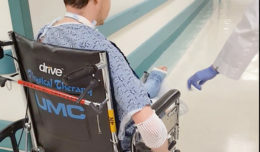 In December 2012, Byers, along with other members of his team, was tasked with a mission to rescue Dr. Dilip Joseph, an American citizen being detained by the Taliban in a mountainous region in the Qarghah’i District of Laghman Province. Byers was the second assaulter on the approach toward the building identified as containing the hostage. While Byers tried to rip down blankets that served as the door to the building, the first assaulter pushed his way through the doorway and was immediately shot by enemy AK-47 fire. Byers, fully aware of the hostile threat inside the room, boldly entered and immediately engaged a guard pointing an AK-47 towards him. As he was engaging that guard, another adult male darted towards the corner of the room. Byers could not distinguish if the person may have been the hostage scrambling away or a guard attempting to arm himself with an AK-47 that lay in the corner, so he tackled the unknown male and seized control of him. While in hand-to-hand combat, Byers maintained control of the unknown male with one hand, while adjusting the focus of his night vision goggles (NVGs) with his other. Once his NVGs were focused, he recognized that the male was not the hostage and engaged the struggling armed guard. By now, other team members had entered the room and were calling to Joseph to identify himself. Byers heard an unknown voice speak English from his right side. He immediately leaped across the room and selflessly flung his body on top of the American hostage, shielding him from the continued rounds being fired across the room. Almost simultaneously, Byers identified an additional enemy fighter directly behind Joseph. While covering the hostage with his body, Byers was able to pin the enemy combatant to the wall with his hand around the enemy’s throat. Unable to fire any effective rounds into the enemy, Byers was able to restrain the combatant enough to enable his teammate to fire precision shots, eliminating the final threat within the room. Byers quickly talked to Joseph and, after confirming that he was able to move, extracted him to the helicopter-landing zone. Byers, a certified paramedic and 18D medic, subsequently assisted with the rendering of medical aid to the first assaulter. Byers and others performed CPR during the flight to Bagram Airfield where his teammate was declared deceased. The Medal of Honor is the nation’s highest award given to members of the Armed Forces for gallantry in action. Byers is the first living active duty member of the U.S. Navy to receive the Medal of Honor since April 6, 1976. He is the first living active duty enlisted member of the U.S. Navy to receive the Medal of Honor since Petty Officer Michael Thornton (also a SEAL) was awarded the Medal of Honor by President Richard Nixon Oct., 15 1973. A husband and father to one daughter, Byers was born in Toledo, Ohio, and began his naval career in 1998 as a hospital corpsman. The following year, he was assigned to Great Lakes Naval Hospital and later served with 2nd Battalion, 2nd Marines, in Camp Lejeune, North Carolina. While on deployment with the 26th Marine Expeditionary Unit aboard USS Austin (LPD 4), Byers earned the Enlisted Surface Warfare Specialist (ESWS) badge and Fleet Marine Force (FMF) warfare device. After graduation, he attended the Special Operations Combat Medic (SOCM) course and was subsequently assigned to East Coast SEAL Teams. He has deployed overseas 11 times with nine combat tours. 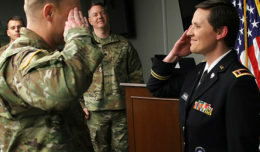 Byers was promoted to the rank of senior chief petty officer in January 2016. In addition to the Medal of Honor, Byers personal decorations include the Bronze Star with Valor (five awards), the Purple Heart (two awards), the Joint Service Commendation Medal with Valor, the Navy Commendation Medal (three awards, one with Valor), the Combat Action ribbon (two awards) and the Good Conduct Medal (five awards). Byers was also be recognized for his accomplishments during a “Hall of Heroes” ceremony at the Pentagon March 1. This ceremony is available for viewing online at www.navy.mil/ah_online/moh/byers-hoh.html.